I have a normal and healthy paranoia when it comes to taxis. I know that the driver is going in circles and even weirder geometries just to run up the fare on me. He recognizes me as a stranger in a strange land and is taking me to the cleaners even though that establishment is nowhere near my house. So, in an unwonted eruption of fairness, I inform you that the other day a Naples cab driver got his picture in the papers. He found a bag with €12,000 (more than $12,000) in the back of his cab, did a bit of sleuthing in his passenger-log for the day and figured out who it might have been. He was right. One phone call and the lucky passenger got his money back. The consensus of opinion at the local coffee bar is that if the sum had been ten times that amount, then it could only have belonged to a plutocrat swine who would have deserved to lose the money. This is solid trickle-down economics that we tamper with only at great peril. On the other hand, twelve grand is a lot of money, but it’s not a fortune. I offered the view that “maybe it was a guy just like you or me”. The bar-owner smiled and said, “Do you walk around with that kind of money in your pocket? If so, step into the back room." The jury hung and we declared a mistrial. The seamier side of human nature —and this one restores my faith— has to do with the small local church of San Giuseppe a Chiaia (photo, above) just across from the Villa Comunale, the large public gardens that extend along the seaside from Mergellina to Piazza Vittoria. One of the priests noticed that the same gentleman came in early every morning to pray. He always sat in the same pew near a small collection box, a simple affair secured with a locked, hinged top with a slot in the top where you can drop in a few coins if the spirit so moves you. The priest also noticed that the collection box, far from being coinful unto overflowing from the generosity of the previous day’s faithful flock, was empty most of the time. Sleuthing, again, came into play, the inductive chain proceeding thusly: (1) box full of coins; (2) man comes in; (3) man goes out; (4) box empty. Eleemosynary, Watson! An undercover cop —posing as I’m not sure what…a confessional?— caught the scoundrel extracting coins back out of the box through the slot using a wooden stick with a piece of chewing gum on the end of it. “But I was just ‘doing alms’, as our Lord and Saviour bade us,” he said. This radical approach to New Testament hermeneutics did not wash with the judge. The blackguard got 3 months. He has promised to reform, or at least change churches. Maybe he will apply for a job as a cabbie. Getting accosted physically —"mugged"— is violent and is funny only in the movies. The best scene along those lines in Italian cinema is from the 1988 film Fantozzi va in pensione (Fantozzi Retires) with Paolo Villaggio. Villaggio (b. 1938) is a Genovese actor/comic who has created the character of Ugo Fantozzi, a good-natured, bumbling and thoroughly mediocre bureaucrat who can do nothing right and whom everyone takes advantage of. 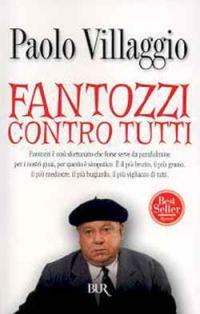 Villaggio brought Fantozzi to life in a 1975 film; through the year 2000, ten films appeared. Some critics have called the character the most original comic "mask" in Italian cinema since Totò. Physically and in mannerism, Villaggio recalls the American comic, Lou Costello, and the character of Fantozzi has become a metaphor in modern Italy of the inept and put-upon Everyman much in the same way as "Walter Mitty" or, more recently, "Dilbert," in the United States. In the scene in question, Fantozzi is picking up his first pension check at the post-office. Outside, of course, the hit-and-run petty thieves on motorbikes are waiting, except that in this comic version they are all waiting in an orderly line, each having taken one of those proper customer-service numbers from a dispenser at the entrance to the thief staging area. When Fantozzi gets his money and heads for the exit, the thief overseer calls out to his charges, "OK, number 32 has left the window. Who has 32?" Two punks obediently raise their hands, and they are then the ones who roar by and rip Fantozzi's pay envelope from his hand as he leaves the post-office. If you don't find that funny, maybe you had to be there, or maybe you have been mugged, yourself. There was certainly nothing funny about it in Naples the other day for Hari Ahuwalia, a gentleman from India in town to sign a "sister city" pact between his city of Calcutta and Naples. In 1992 Mr. Ahuwalia was on the first Indian expedition to Mt. Everest. Also, he was wounded more recently in an India/Pakistan border clash, as a result of which he is confined to a wheel-chair. He was sitting outside of the Villa Pignatelli on the Riviera di Chiaia, a popular tourist attraction in the city these days. He was, foolishly, wearing a Rolex watch. He was assaulted by two young thieves who took his watch and sped off. The city was not pleased. It is true that he got his watch back, but not, as one paper reported, because the thieves "repented". That lends an undeserved Robin Hood/not-so-bad guy flavor to the episode. What apparently happened was that really bad "good guys" —very tough plainclothes cops— went into the Spanish Quarters of Naples, where they know many of these petty thieves hole up and threatened to sit on the place forever. They can micro-harass an entire neighborhood to death —confiscate motorbikes, ticket people for not wearing safety helmets, for not having their "papers" in order, for littering, for jaywalking, etc. The next day, the cops got the phone call they were waiting for: the watch is in a bag at such-and-such a corner. The retrieved it, and an agent flew to the Milan airport to return it to Mr. Ahuwalia just as he was about to leave for home.